Indexing: Blake Butler in New York, John Barth, Tina Fey, and More! above: Julian Schnabel, “Dennis Hopper” (1991). It’s been a week of surreal literature around these parts. It began with Bruce Chatwin’s In Patagonia, which — although nonfiction — knits together myths, echoed stories, cryptozoology, the vagueness of borders, and the limitations of memory into a travelogue that (I daresay) echoes Werner Herzog’s notion of “ecstatic truth.” After that came both volumes of Adam Novy’s The Avian Gospels, for a review to appear on Word Riot. (Mr. Diamond spoke to Novy about both books last year.) And most recently, I delved into Leni Zumas’s collection Farewell Navigator, a book about which I’d heard fantastic things. Where Zumas excelled, at least for me, was in her ability to precisely evoke certain niches of life (whether cultural or otherwise) while adding surreal details. “Handfasting,” with its depiction of idle teens and twenty-somethings whose world is suddenly jarred by the arrival of a witch into their lives, is just about perfect; and the balance of tactile details and emotional dovetailing in “Heart Sockets” is equally impressive. But that specificity is an interesting tool — throughout what I’ve heard so far, the generalities used to describe the family at the center of this book create a sort of rhythm, one which furthers the novel’s mood of alienation. When Butler turns to naming something (or someone) specific, the contrast is both disarming and disorienting. And the accumulated effect is stunning. We’ll see what tomorrow brings. After hearing David Foster Wallace talk about his complex admiration, unrequited bromance, and eventual excommunication from the literary church of John Barth, I finally picked up the copy of Lost in the Funhouse that was propping up my kitchen table. I’m not yet a third of the way through, but the result has been an amusing look at the kind of stuff that actually spawned now scarlet-lettered words like ‘metafiction’ and ‘postmodern’. When you have a guy writing a complex list of suggested procedures one should undertake in reading the book on page one, then on page two answers lit critics of said procedures who resented them in the hardcover edition, you know you’re going out back to the wood shed of our little microcosm. Perhaps most surprising then is how clear and direct most of the prose is: yes these are word games, but they’re word games that anyone can play, and which are designed to be inclusive and fun. Barth seems to be suggesting, as in the case of naming a character Magda G ______ from B______ Street and urging us to fill in the blanks, that this is a book wherein our pleasure or dissatisfaction will often come from what we put into it, and that unlike the pale imitations Barth, Coover, and Pynchon spawned in recent years, the objective is to engage the reader rather than alienate or dupe. I also got pretty into this profile of painter/visual artist Julian Schnabel in this month’s Art in America. It proposes itself a defense of Schnabel, and in doing so proposes that he’s presently out of style. This was all news to me. 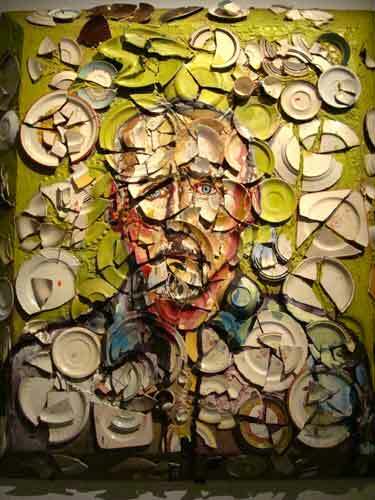 Schnabel’s 1980s work mergers of paint and broken ceramic plates onto canvas has been evaluated and reevaluated by so many critics. Schnabel has also directed three pretty excellent feature films since 1996: Basquiat, Before Night Falls, and his particularly imaginative adaptation of Jean-Dominique Bauby’s memoir, The Diving Bell and the Butterfly. Gregarious, barrel chested, and perpetually draped in plaid, Schnabel feels largely of the old world (read: the Sixties! ), and the profile does a fine job of contrasting his meatier plate work with his attempts to be the next Warhol. His painted tributes to pop stars that left me limp: do we need to see Jane Birkin’s name written fancifully on a white tarp? Do we need to pay half a million dollars for it? But Schnabel, once a self-professed enfant terrible who in print came off as kind of a douche, today has the resignation, roots, and world-weary dirty shoulders of a late-innings Picasso, Marquez, or Atwood, and via film seems to be reaching new heights. I’ve been helping my girlfriend move, so I’ve been drinking a lot of red wine straight from the bottle, and listening to Neil Young off my laptop. Due to the moving of heavy boxes and chugging of red wine, my reading time has taken a hit over the last seven days. I started re-reading Jennifer Gilmore’s Something Red to ready myself for an interview (coming soon…). Also read the most recent Tina Fey piece in The New Yorker, and I can say that I am 100% ready for her book to come out.